Analysis: Who Is Burning Homes in Rakhine State? 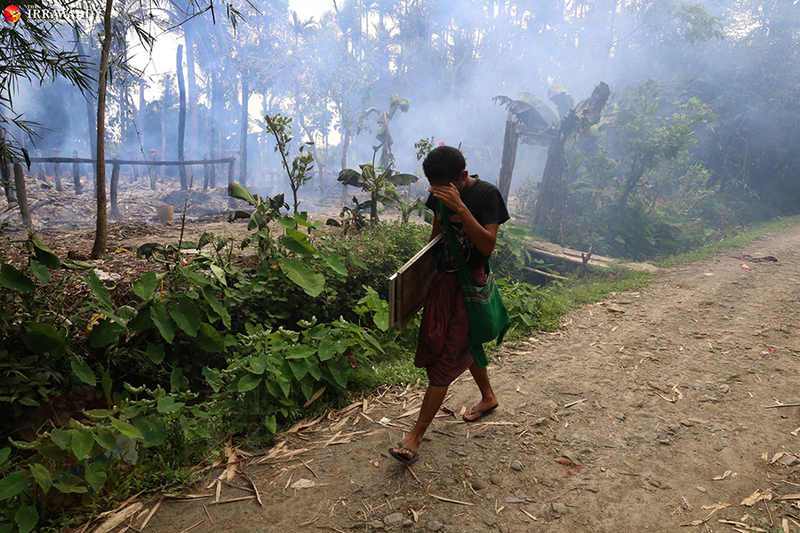 MAUNGDAW, Rakhine State — In the three weeks since Myanmar security posts were attacked by the Arakan Rohingya Salvation Army (ARSA), more than 2,600 homes have been torched in more than 60 villages. Rights advocates have said that security forces and local extremist Buddhists could have committed these crimes as part of the Myanmar Army’s clearance operations in northern Rakhine State, which followed coordinated attacks on police outposts by the ARSA on Aug. 25. In contrast, the Government Information Committee has said that Muslim militants burned these homes before leaving the villages, as the inhabitants seek refuge in Bangladesh. Photos and stories have gone viral depicting Arakanese and Mro Buddhists, and Rakhine Hindus being killed or injured by Muslim militants, and describing their fear of them. Muslims speak of being afraid of security forces, militants, and Buddhist nationalists as well. Area residents are apprehensive about living near other communities of which they are now suspicious. Amid this tension, the burning of homes has continued. 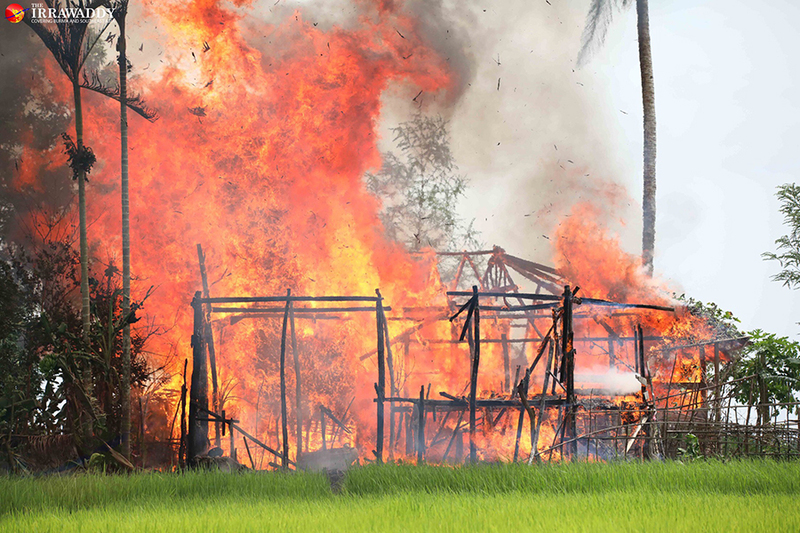 On Thursday, Irrawaddy reporters and a group of journalists on a government-organized reporting trip witnessed that houses in at least two new villages, including a Muslim community called Gawdu Zara, had been torched. The presence of non-Muslim local residents armed with swords and sticks seen at the blaze of an abandoned village on Sept. 7 in Maungdaw Township triggered suspicion as to why were they were there. When asked, they answered in Burmese that they “came to look at what happened in the village,” and said no more. The journalists witnessed a few of them on the roads carrying household items that were likely taken from the smoldering homes. Some held knives and slingshots. A villager who carried away some looted household items in a cart—a mat, buckets, and kitchen utensils—told The Irrawaddy team that they “took them from those abandoned Muslims’ homes,” but these reporters did not hear them admit whether they had started the fire. Further down the village road, the group of journalists saw houses freshly set alight, a jug of gasoline left on the road and matches nearby, but, from the road, could see no people. The police accompanying the journalists appeared at ease in this situation and did not interrogate or detain the looters. It is possible that they might have been curious onlookers. They could have been carrying swords for their own safety in a time of chaotic violence. But the security forces should have questioned them about their presence at the scene and about the burning homes. If they were suspicious, the police should have proceeded according to protocol. But those things didn’t happen. These actions raise doubt about the authorities’ framing of the situation in Rakhine State. After livestreamed reports and photos of the burning of Gawdu Zara went viral, the government said, hours later, that local administrative officials were investigating the incident. If the government did not act according to the rule of law concerning those people looting from the abandoned homes, or the arson, the whole narrative could change, affecting Myanmar’s image. After just over two weeks of military clearance operations following ARSA attacks on police outposts, the UN has reported that 270,000 Muslims have fled across the border to Bangladesh; around 30,000 Arakanese Buddhists and Hindus remain internally displaced. Maungdaw Township remains under a dusk-to-dawn curfew, and many shops in the town itself have closed. As of last week, some 15 members of government security forces have been killed, as well as 370 suspected militants, as of last week. The government announced on Friday that authorities have detained 50 more people who they suspect of being ARSA members. It is unknown how many civilians have been killed in total.